Economic gurus got one part of the mortgage forecast for 2019 correct. We’re certainly seeing a volatile year for rates. Now — instead of seeing mortgage rates edge closer to 5.25 percent as some had predicted we’d see in 2019 — we’re looking at an average 30-year rate near 4 percent. “This drop in rates is going to give the housing market a boost,” said Bill Banfield, executive vice president of capital markets for Quicken Loans. Going back four months or so, most forecasts weren’t expecting mortgage rates to drop as low as 4 percent for borrowers, Banfield said. “This is a surprise to a lot of people,” Banfield said. The average 30-year rate was 4.1 percent as of late March, the lowest rate since January 2018, according to Bankrate.com data. But rates started to rebound a bit upward in early April. The average 30-year rate went back to 4.29 percent as of April 3, according to Bankrate.com. By contrast, the average mortgage rate was 5.1 percent as recently as mid-November, which was a 7 1/2-year high, according to Bankrate.com. The average was hovering around 4.75 percent as 2018 drew to a close. We’re talking about some real money here for home buyers. Take a $200,000 mortgage. The mortgage payment for principal and interest would drop by about $120 a month if your rate is 4.1 percent instead of 5.1 percent on a 30-year mortgage, according to Greg McBride, chief financial analyst for Bankrate.com. Being able to lock in a 30-year fixed rate near, or even below, 4 percent helps put some “wind in the sails of home buyers from an affordability standpoint,” McBride said. “This is a very attractive rate, which will lift the key spring home selling season,” said Mark Zandi, chief economist for Moody’s Analytics. How attractive? Well, it’s just a notch above the record low of 3.5 percent in late 2012. And if you go back 30 years, home buyers were looking at an average 30-year rate of 11.13 percent in early April 1989, according to Bankrate.com’s data. For sale signs aren’t flooding the landscape so the lack of available homes remains a problem. In some cases, too many buyers continue to be chasing too few sellers. 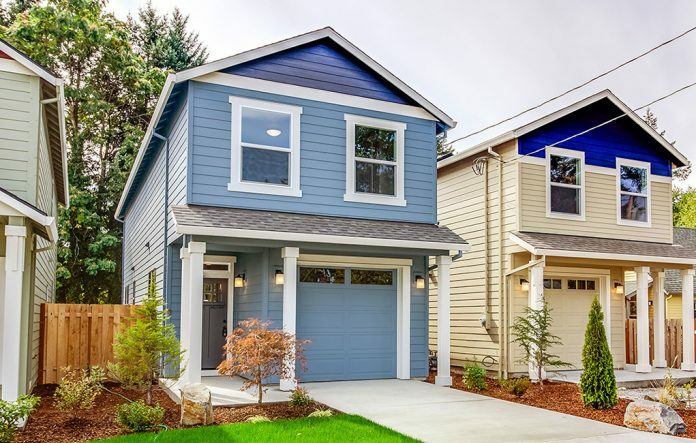 “It is not going to take a first time buyer from a small home to a big home, but it does definitely have a small effect on purchasing power,” said Tim Gilson, associate broker for Keller Williams Domain and the Gilson Home Group in Birmingham, Mich.
“Virtually all banks (and some non-banks) have some form of first-time home buyer programs,” said Keith Gumbinger, vice president for HSH.com. You might be able to get some sort of subsidy on a down payment, perhaps a reduction on closing costs. Or maybe some lenders offer a mortgage to first-home buyers through a relaxed credit score or some more wiggle room relating to how much debt you’re carrying relative to your income. Gumbinger said an FHA loan is a favorite of first-time home buyers, as the U.S. Department of Housing and Urban Development does not use risk-based pricing. In some cases, first-time buyers can find programs that offer a mortgage with down payments for 3 percent or 3.5 percent of the purchase price. “Some of these changes reflect the reality that first-time home buyers find it challenging to find an attractively priced home. A smaller down payment can mean a larger mortgage and higher monthly payments. “Many of these programs look to soften that impact,” Gumbinger said. To qualify, the borrower or the property must meet some low-to-moderate income guidelines. The mortgage can be made for a home in a low- to moderate-income census tract in markets where Flagstar has bank branches. Or a low- to moderate-income borrower can purchase in any tract, as long as it’s a county where Flagstar has a banking presence. The maximum loan amount varies by state. The rate on the Destination Home product will vary based on the market. On Tuesday, the annual percentage rate was 4.756 percent. “We’re seeing a robust start to the spring with this product,” said Beverly Meek, first vice president and community reinvestment act director for Flagstar. More than 28 percent of mortgage approvals made in the first quarter of 2019 had a credit score of less than 640. Nearly 83 percent of FHA home-purchase loans made in January went to first-time home buyers, according to FHA. Just under 40 percent went to minorities. The tighter standards would impact those who have the weakest financial profiles — FICO scores under 640 with debt-to-income ratios above 50 percent. “The FHA change does mean greater scrutiny,” he said, noting that higher-risk applications would go through a manual underwriting process. “It’s fair to say that some buyers won’t be able to get a loan until their financial profile improves a bit,” he said. To be fair, a low credit score and high levels of debt going in significantly increases the risk of a loan failure. Consumers don’t want to end up dealing with the “emotionally difficult loss-of-home foreclosure process” either, he said. “Better to wait and try again at a later time to help improve the odds of success,” Gumbinger said. Beth Martinez, who works on financial and home ownership education for the Michigan State University Extension in Detroit, said a HUD housing counselor can help a consumer improve a credit score over time by identifying trouble spots. There may be ways to spot errors and figure out ways to reduce or eliminate outstanding debt. “It can take from a few months to two years to improve a credit score,” she said. “Improving a credit score improves the chances of being approved for a mortgage loan and can lower the interest rate that the consumer qualifies for,” Martinez said.